Because I prepare my biochar in an unusual manner people tell me that it is not proper charcoal.No matter, perhaps the black stuff used by the ancient Amazonians to make terra preta wasn't proper charcoal either. 'Proper' charcoal is made by a slow process of combustion and modern commercial biochar is made by pyrolysis in special equipment which also captures volatile organic fuels. As I have previously explained I make my own black stuff on a very hot blazing fire when I immediately douse the burning embers with several buckets of water. As for for the huge fire I made last year when we cut down Cathi's overgrown hedge it required extended visits with the hosepipe. I now regard it as a crime when a gardener lets his bonfire burn through for several hours to make ash. My beautiful black contains the same level of potash and lime as next to useless wood ash and has the physical bulk to absorb air, water and nutrients and be a substrate for mycorrhiza which in the long term will potentially produce glomalin. It also will hopefully last in my soil for hundreds of years as sequestered carbon. My black stuff is quite lumpy and for nearly ten years now I have added barrow loads to my vegetable garden and the nature of my soil is starting to change. Hitherto other than an earlier half hearted earlier failure, I have not used my charcoal to make up potting compost. I now wonder whether my previous unpromising experience was a result of not adding enough nutrients. Charcoal is a very powerful absorbent. Some of my older readers might remember 'hush puppy' shoes where charcoal in the lining was used to absorb odours! Charcoal's ability to absorb and hold very large amounts of nutrients is one of its merits but it would seem to need ‘priming’. I must be careful however not to confuse charcoal’s ability to hold large organic molecules with the capture of nutrient ions. Nutrients are held on the large surface area of charcoal as a result of negative electrical charge which gives it a cation exchange capacity. When char is matured in the soil this capacity increases. The ancients probably matured their charcoal in their middens of plant debris and animal faeces and in my own version the eighteen barrow loads of char from Cathi's fire last year has been composted with organic waste from my garden ponds and cut tops of herbaceous perennials. Over the year my huge heap has been gradually fertilized with a total six kilograms of 20:10:10 agricultural compound fertilizer. My mixing was quite crude when I deposited the char on a thick bed of decaying herbaceous tops and topped it with waste from my ponds. Whenever I spread fertiliser in my garden I gave it several handfuls. Over its nine months so far my pile has decreased little in volume. It was a fifty/fifty mix of organic matter and char. The charcoal of course does not decay and despite the extra fertilizer nitrogen which might be expected to create a favourable carbon/nitrogen ratio for composting, the mix is still very fibrous with tough ‘straw like’ organic matter. I intend to ‘play’ next year with this mix to make up potting compost! My results will be entirely subjective and will have no scientific validity. It’s just that I garden this way, always trying something different! 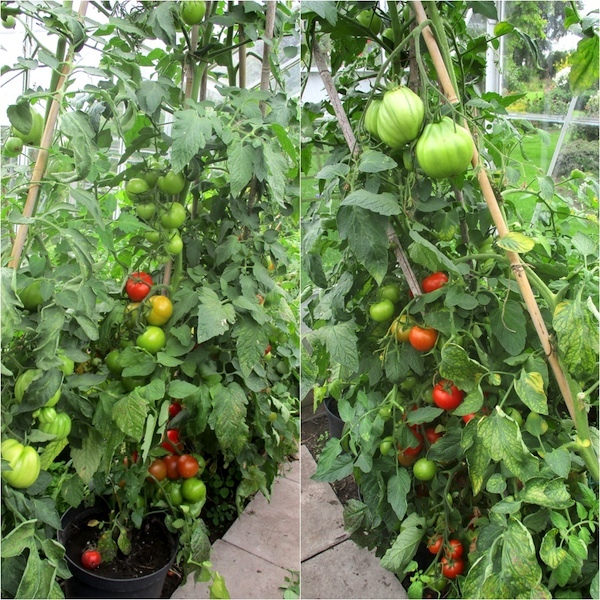 My existing vegetable garden surface is now quite black and last season I scooped up char rich soil from the surface of my veg garden soil to make up my ten litre pots of tomato compost. I have been impressed with this crop of tomatoes but there are far too many variable factors for me to draw any conclusions. I estimate that my tomato soil is between five and ten percent charcoal. Tomatoes need high levels of nutrient and I have fertilized them freely. Perhaps adding small amounts of char is enough to amend some otherwise unsuitable soils to use as compost? Charcoal as a seed and potting compost ingredient. This is no wild idea and charcoal has long been used. I believe it is sometimes used in Japan and some orchid composts are thought to benefit from its physical and absorptive properties. I understand in South America, extracted terra preta is sold as compost in their garden centres. I bristle with disapproval at potential destruction of historic fertility but imagine it is wonderful compost. Amazonian farmers claim that it renews itself! I imagine the true explanation is that for terra preta soils which might be as much as two metres deep, scraping some away seems to be insignificant. The claim of renewing itself might not be entirely bogus in that arbuscular fungi associated with the carbon and in mycorrhizal relationship with the plants might accumulate glomalin. As I have hinted I wonder if fresh char might be an absorber of nutrients rather than a provider. Hence my heavy fertilization of my composting pile. There are other ‘straws in the wind’ that ‘preparing’ char might be a good thing. Fresh char contains volatile organics that have deposited on its inner surfaces which with time will be degraded by fungi and bacteria. Also cation exchange capacity is thought to improve in the soil over decades! What I will be trying next year is to use some of my large pile to make up some seed and potting composts. I will use some ‘neat’ and some mixed fifty/fifty with my soil. I will fertilize them as described in my previous post. My charcoal pile has been marinating for eight months now. I have included charcoal in my series on composts out of my own interest and curiosity. I don’t think any of my readers should conclude they should rush out and buy charcoal! I suspect most commercial sources of charcoal such as those for the barbeque and fish tank cleaning are useless to the gardener! There was some interesting data about the effects of biochar from Southhampton University last year. They grew laboratory plants in charcoal up to the equivalent of 50 tons per acre. This is well over twice the level that I have found to be suggested as a soil additive but comparable with the levels I will try in my compost. 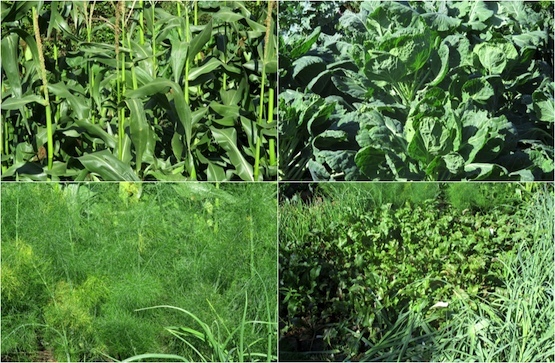 The experimental plants were lettuce and thale cress - that weed that is the traditional darling for scientific research. Their results showed exceptional stimulation of plant growth by as much as 100%. Unfortunately they also showed that genes responsible for pest and disease resistance were ‘switched off’. They have no data whatsoever that the charcoal grown plants actually suffered from pest and disease. This latter finding has been deemed to be a bad thing and might spell the doom of growing with biochar. This supposition is complete nonsense but does need careful investigation. I wonder whether the genes being switched off might merely be an indication of healthy growth and that active genes switched on is a waste of resources when there is no pathogen threatening. After all we keep reading about plants signaling the presence of pathogens and switching protective genes on. Southhamptons’s suggestion of doubling of growth is remarkable albeit not surprising considering the extremely high yields of terra preta soils. It is not unusual for lettuce to grow very rapidly indeed when conditions are ideal or apparently ideal as in such as in hydroponic production. Wiki says that thale cress completes its life cycle in six weeks. It seems to me that this weed sets seed within ten days from a young not yet flowering plant. My point is that plants are extremely plastic in their growth rates depending on a multitude of growing conditions. Perhaps they should trial what happens to gene expression in peat and other organic composts. I presume Southhampton’s trial must have had a range of rates of biochar addition and I would expect the range to include zero char added. But added to what? I imagine it must be just plain agricultural soil as stated in the very brief reports I have seen. Although I seem to spend my life telling people how good my own soil is as a growing compost this is not true for most soil textures. Is the claimed doubling of growth the comparison between plain soil and the very high maximum char? If so, I am not surprised at the vastly improved growth. After all, all gardeners ‘know’ that soil in a pot is inferior to compost! Perhaps good compost increases growth stimulants too? I am reminded of my old foreman’s opinion of the new fangled peat loamless composts when they were introduced sixty years ago. He noticed that plants grown in the peat composts grew much quicker than in the traditional soil based composts. His composts were potted very firmly (ugh) and growth was stiff and slow. He used to talk about ‘soft’ and ‘hard’ growth and always claimed that his soil based John Innes plants were healthier! Shades of genes being switched on and off I wonder. Not relevant to this post, but a big thank you for your 2013 post on Honey Fungus, which I have just read and found extremely reassuring! We have just lost a weeping birch and I suspect honey fungus, and was beginning to panic, but your reasoned words have certainly helped. Comments on old posts are e mailed to me by google and I will always reply on the site. One of the nice surprises to me when I started blogging was that old posts never die! Interesting post Roger, not being up to date with the development of biochar the only time I have come across charcoal being used with any significance is in bulb fibre where it was added to keep the compost "sweet". We used to talk about "hard" and "soft" growth but that was generally when referring to the results obtained from using high nitrogen fertilizer. Yes it is I think a nutritional thing and organic composts seem to give lusher growth. Yet a further thought Rick about charcoal absorbing toxins and creating a healthier root environment. Perhaps the perfect soil conditions created by charcoal was the reason why Southampton's genes were down. Loved your ideas here on composting which saves money on landfills and recycles in replication of what nature does. I person doesn't have to be an educated genius to understand and follow nature's basic fundamentals and principles. At the same time all practices don't actually need the scientific stamp of approval as are often insisted upon over there at the Garden Professors blog. They are shackled to the large corporate business interests of industrial science, hence much of the Academic funding comes from such entities and administrators knows this, hence the Scientific Orthodoxy needs to give it's stamp of approval in order for something to be viewed as etched in stone truth. Issac Newton and William Whiston ran afoul of the religious orthodoxy over there in your Cambridge for not believing and following what the Orthodoxy mandated as truth. I'm not a fan of GMOs or the Agro-Chemical industrial practices which have an iron fisted grip on agriculture and academia. Mostly because neither practice is needed and despite the public relations otherwise, they do not replicate nature. I've replicated nature on a large commercial scale both with Habitat Restoration and large commercial landscaping which I found chemical synthetics useless to the tasks I had. Use chemicals and you'll find you need to use others to combat the domino effects of other consequences which follow. I accidentally found your blog over off the name tag at the Garden Professors blog which I don't really follow so much anymore, but the criticism of Harvard was the last straw, so I've recently written about their own version of bad science vrs good science which replicates nature by means of Biomimetics. Thanks for your detailed comments Kevin and I have had a look at your very stimulating blog. I shall add it to my blogger alerts! I suspect that we have a love of free thinking which we share but we might not agree with all issues about pesticides. You might not have caught up with my love of glyphosate! I have just discovered the professors and find them very stimulating. I have just come across this quite old blog and am interested because, last year, for the first time, I kept a compost heap, using garden and kitchen waste. I was very proud to have a rich brown compost to use this year! However, I have recently discovered that the area where we have for year had bonfires to burn hedge/shrub prunings has turned into a large, deep pile of black, soft earth. I only realised this when I saw that the rabbits had been trying to tunnel into it. I don't know how nutritious it can be but wonder if I can use it for the benefit of the garden and would be very grateful for advice on this. It won't be particularly nutritious Caz but its physical properties will be highly beneficial as my even earlier posts on biochar say. Put biochar into the search box. But are you not denuding your bonfire site? Roger! I am always support natural farming, which does not involve any chemical fertilizers. ultimately it is killing our land. Your insight is welcomed here. We can make our compost by utilizing kitchen waste and natural leafs.